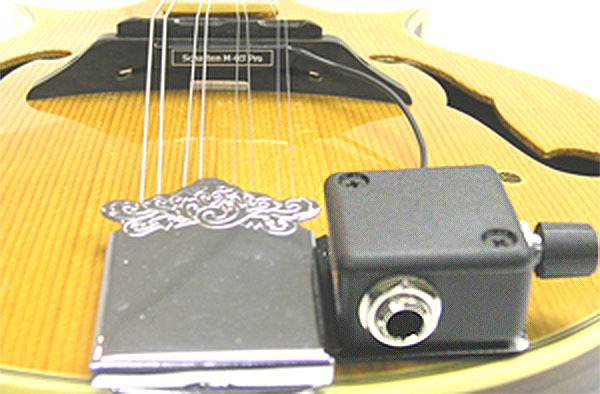 You don't have to change the bridge on your mandolin in order to get a good sounding pickup. The new Schatten M-06 PRO stick-on mandolin pickup attaches to your existing bridge and requires no modifications to your instrument. This model also includes a convenient thumbwheel volume control built right into the side-mounted clamp-on jack. The M-06 pickup sensor is small and light in weight. Measuring only 1/4" high by 1 1/2" in length it does not affect the acoustic sound of the instrument and will work on all 'normal' adjustable mandolin bridges. It will also operate properly on an Original Brekke bridge as well. Works with bridges that have a total string spacing of up to 1.5". Not designed for octave mandolin, please contact us if you need a pickup for that instrument. The M-06 pickup adheres to the bridge with either the supplied putty (if you're planning on installing and removing the system on a regular basis) or the VHB foam tape (for a more permanent installation). The low-profile MVC jack assembly attaches to the underside of your existing tailpiece, no drilling or modifications required. This pickup provides clean, clear sound reproduction, and has sufficient output to drive most amplifiers directly without a need for a preamp. If you are plugging into a mixer or PA system you may require a preamp to increase the signal strength to match that system. We recommend the Schatten Mini-Pre preamp for this pickup system. String spacing: Up to about 1.5"